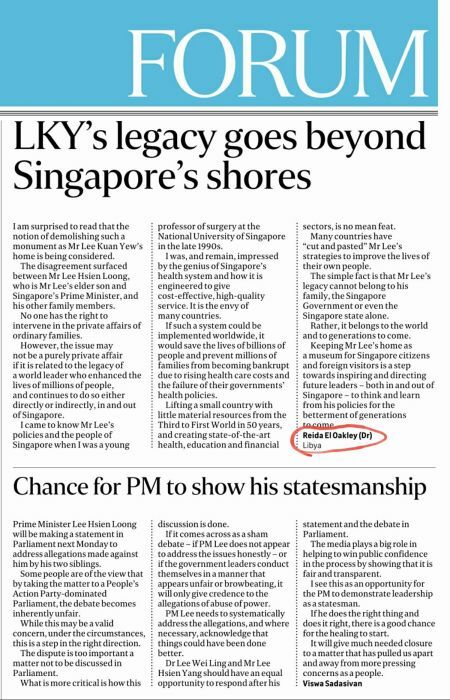 ST made a damaging mistake to publish a letter by a foreigner on LKY's house without first proving this person is qualified to do that i.e., the writer must show he understands Singapore and not just admire and be in awe of it. If LKY had not asked for his house to be demolished, most of us would be happy to see it preserved. But he hadn't and instead asked for it to be torn down. How could we say no to him after what he had done for us? We KISS i.e., keep is simple, stupid. I am shocked the PAP government wants to go lower than stupid. ST has recently started to do the same and obviously acting the part of the PAP party newsletter. But we are not so stupid, and they better heed Viswa Sadasivan advice above. Google: Whatever happened to "Don't be evil"
38 Oxley Road: Would ESM Goh please help? Paris Accord: Which way Trump?